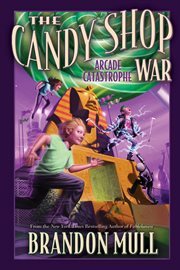 The item Arcade catastrophe, Brandon Mull, (ebook) represents a specific, individual, material embodiment of a distinct intellectual or artistic creation found in Charlotte Mecklenburg Library. It will take more than magical candy to win this war! Something fishy is going on at the new amusement center in Walnut Hills. The trouble seems linked to the mysterious disappearance of Mozag and John Dar, who have spent their lives policing the magical community. When Nate and his friends are asked to help investigate, they discover kids feverishly playing arcade games in an effort to win enough tickets to redeem one of four stamps: jets, tanks, submarines, and racecars. Rumor has it that the stamps are definitely worth it. But what do they do? The kids soon discover that the owner of Arcadeland is recruiting members for four different clubs. When each club is filled, he will begin his quest to retrieve a magical talisman of almost unimaginable power. With John Dart and Mozag sidelined, will Nate, Summer, Trevor, Pigeon, and their new friend Lindy, find a way to save the day? Find out in this sweetest adventure ever!